On 7 September 2011, Yak-Service Flight 9633, a Yakovlev Yak-42 charter flight carrying players and coaching staff of the Lokomotiv Yaroslavl professional ice hockey team, crashed on take-off near the Russian city of Yaroslavl, killing all but one of the 45 people on board. The aircraft overrun the runway at Tunoshna Airport before briefly lifting off, struck an antenna mast, caught fire and crashed on the bank of the Volga river. Lokomotiv Yaroslavl, a member of the Kontinental Hockey League (KHL), Russia's top ice hockey league, was on its way to Minsk, Belarus, to start the 2011–12 season. All players from the main roster and four from the youth team were on board and died in the accident. The only survivor was the aircraft's flight engineer. The subsequent investigation determined that several factors contributed to the accident, including poor training, the incorrect calculation of the take-off speed by the flight crew, and the inadvertant application of wheel braking by one of the pilots, who had improperly placed his feet on the pedals. It was later revealed that the pilot had used falsified documents to obtain permission to fly the aircraft, and that both crew members lacked the training necessary to fly the Yak-42. At the time of the crash, Lokomotiv Yaroslavl was one of the top ice hockey teams in Russia, originally established in 1959. The team won the Russian Open Championship in 1997, 2002 and 2003, and were finalists in 2008 and 2009, making it to the third round of the playoffs in four straight seasons. Lokomotiv lost in the 2010 KHL Western Conference Finals 4–3 to HC MVD, and lost in the 2011 KHL Western Conference Finals 4–2 to Atlant Moscow Oblast. Several players were about to make their debut with the team, including former National Hockey League (NHL) players Ruslan Salei, Pavol Demitra, and Kārlis Skrastiņš. Also set to make their coaching debuts were former NHL players Igor Korolev and Brad McCrimmon. The accident was the second plane crash in Russia involving a hockey team. The entire VVS Moscow team died in the 1950 plane crash near Sverdlovsk (now Yekaterinburg). In 2009, Yak-Service, the airline operating the accident aicraft, had been investigated by the European Commission following airworthiness and air safety concerns. Russian authorities imposed restrictions on the carrier, and made Yak-Service subject to ramp inspections to international standards. In May 2010, the Russian transport ministry prohibited Yak-Service from flying into Europe, a restriction that was lifted the following August. The European Commission, however, was not satisfied that mandatory equipment was present on all Yak-Service aircraft, and banned two of the company's Yakovlev Yak-40s from operating in European airspace. On the day of the accident, the weather at Tunoshna Airport was good, with light winds, good visibility and a temperature of 18 °C (64 °F). The Yak-42  entered Runway 05/23 at taxiway 5, located 300 metres (980 ft) from the runway threshold. Runway 05/23 was 3,000 metres (9,800 ft) long, leaving 2,700 metres (8,900 ft) for the take-off run. After the aircraft was cleared for take-off, it accelerated to an estimated 230 km/h (140 mph) but failed to lift off. The Yak-42 ran off past the end of the runway for 400 metres (1,300 ft) before lifting off. It then struck a beacon tower mast located about 450 metres (1,480 ft) from the end of the runway, without climbing more than an estimated 6 metres (20 ft) from the ground. .
After the impact with the mast, the aircraft veered left and crashed on the riverbank of the Tunoshna River, 200 metres (660 ft) from where it joins the Volga River, losing its tail assembly on impact while the front part of the jet disintegrated. The tail section came to rest in the water, while the rest of the fuselage ended up on dry land. The location of the wreckage was approximately 2 kilometres (1.2 mi) from the end of the runway. Witness reports described the aircraft as "bursting into flames" after hitting the mast. Another witness report described the engines as going silent moments before the crash. Another report indicated that the aircraft hit some trees before it crashed. A security surveillance camera mounted on the mast recorded the approach of the Yak-42 at high speed, running off the end of the runway, only metres above the ground, the nose pulling up moments before impacting the mast. Debris from the aircraft was found just past the mast site, continuing from that point to the crash site. The crew did not report any technical problems to the airport controllers. The aircraft invovled, a Yakovlev Yak-42D with registration RA-42434 and serial number 4520424305017, was manufactured in 1993. After serving with several airlines, it joined the Yak-Service fleet. The Yak-42, a three-engine medium-range passenger jet, was designed with a 36-year service life, and RA-42434 still had an estimated 60% of its service life remaining. According to Deputy Transport Minister Valery Okulov, one of the three engines on the aircraft had been replaced a month prior to the crash. The aircraft was due to be taken out of service at the end of 2011 for a scheduled major overhaul. 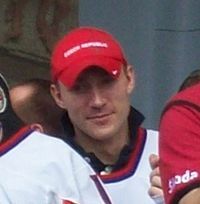 Karel Rachůnek was the team captain at the time of the crash. Josef Vašíček led the team in goals in the preceding season. Pavol Demitra was a three-time All-Star in the NHL. The aircraft manifest listed 8 crew members and 37 passengers. The flight crew was composed of captain Andrei Solontsev, who had 6,900 hours of flight experience of which 1,500 on Yak-42s, first officer Sergei Zhuravlyov, with 15,000 hours' experience of which only 420 on type, and flight engineer Alexander Sizov, the only survivor of the crash. Alexander Galimov, one of the team players on board, was found alive and hospitalized, but died five days later. The bodies of the victims were all recovered from the scene. According to eyewitnesses, both Galimov and Sizov were severely burned, but were conscious while being rescued. Both Galimov and Sizov were transported to Moscow for treatment. The two were placed in medically induced comas to relieve stress; however, Galimov died on 12 September at the Vishnevsky Institute of Surgery. Sizov was moved from intensive care to a ward on 12 September, and his life was considered to be out of danger. He was discharged from the hospital on 28 October. Goalkeeper coach Jorma Valtonen was not on the aircraft as he stayed behind to work with the junior team. Russian President Dmitry Medvedev and Turkish President Abdullah Gül laying flowers outside Arena-2000 in Yaroslavl on 8 September. Russian President Dmitry Medvedev, who had been on his way to Yaroslavl for the Yaroslavl Global Policy Forum, sent his condolences to the families of those killed in the crash and visited the crash site along with Governor of Yaroslavl Oblast Sergey Vakhrukov. René Fasel, president of the International Ice Hockey Federation, called the crash "the darkest day in the history of our sport." Manchester United chief executive David Gill wrote to the Russian side to offer support and sympathy after hearing of the tragedy, which bore unsettling similarities to the Munich air disaster which cost 23 United players, staff and journalists their lives in 1958. Yaroslavl announced a three-day period of mourning from Friday 9 September 2011 to Sunday 11 September 2011. Upon hearing the news of the accident, Kontinental Hockey League officials stopped the Salavat Yulaev Ufa–Atlant Moscow Oblast game that was being played. The game was suspended in the second period, and KHL president Alexander Medvedev addressed the audience at the game, informing them of the details of the tragedy. Medvedev promised "We will do our best to keep the high-level hockey in Yaroslavl." A minute of silence was held and the audience exited the arena. The two teams left to go to a nearby church. The following day in Minsk, at the arena where Yaroslavl was to play its first game of the season, a requiem Mass was celebrated to honor the dead. The KHL resumed its 2011–12 season on 12 September 2011, with seven games. All games were preceded with a minute of silence. Early into New York Islanders training camp, goaltender Evgeni Nabokov, having played the previous season in the KHL, expressed shock and disbelief at the news, and was deeply saddened. On 10 September 2011, memorial services for the players were held in their mother countries. The biggest services were held in Arena 2000, the home arena of Lokomotiv Yaroslavl, with thousands of mourners as well as Russian Prime Minister Vladimir Putin in attendance. Local police determined the crowd number at Lokomotiv's home arena to be roughly 100,000. Lokomotiv executives met to discuss the team's future. In the discussion, team president Yuri Yakovlev announced that Lokomotiv would not participate in the 2011–12 KHL season. On 12 September 2011, after the death of Alexander Galimov, Lokomotiv Yaroslavl marketing manager Ivjiny Chuev said that another memorial, this time specifically for Galimov, would be held on 13 September 2011. Mario Lemieux joins Evgeni Malkin and Alexander Ovechkin for the ceremonial puck drop before 13 October 2011 game between the Penguins and Capitals. In the United States, the Dallas Stars, the team which Kārlis Skrastiņš played for the previous two seasons, honored their former teammate by placing a decal with Skrastiņš's number (37) on the helmets of their players. Josef Vašíček's former NHL team, the Carolina Hurricanes, wore a commemorative patch on their jerseys during the season. The Detroit Red Wings wore a patch on their 2011–2012 uniforms with the initials of Ruslan Salei, who had played for Detroit during the previous season. The patch the Red Wings wore also honored Brad McCrimmon, who had played for the team and been an assistant coach, and Stefan Liv, who was drafted by Detroit and played for their minor-league team. Furthermore, the Anaheim Ducks embroidered Salei's number (#24) on their jerseys for the season. The New Jersey Devils wore a commemorative patch on their jerseys honoring former Devils players Karel Rachůnek and Alexander Vasyunov. The St. Louis Blues also held a memorial ceremony for former players Pavol Demitra and Igor Korolev before their 8 November game against the Chicago Blackhawks. The Blues players also wore a special '38' sticker on their helmets, as both players wore that number with the Blues. St. Louis Blues goaltender Jaroslav Halák also had his 2011–12 goaltending mask made with a tribute to his fellow Slovak Demitra on the backplate. In Sweden, over 10,000 relatives and fans of HV71 attended Kinnarps Arena, HV71's home arena, to mourn Swedish goaltender Stefan Liv who died in the crash. The Slovak Ice Hockey Federation announced that the jersey number 38 would be retired from the national team in memory of Pavol Demitra, who recently retired from the national team in May on home ice, at the World Championship Slovakia hosted for the first time and who would be the in memoriam inductee of the 2012 Class of Slovak Hockey Hall of Fame. Furthermore, it was announced that Team Slovakia would have a minor number 38 sewn into the jerseys up until 2012 World Championship. Demitra was further honoured by a public ceremony at a hockey stadium in Trenčín, which bears his name since late 2011 (Pavol Demitra Ice Stadium) along with an elementary school attended in Dubnica nad Váhom. 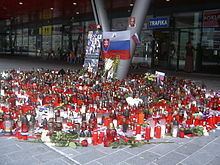 Thanks to Demitra's popularity spontaneous gatherings also took place across Slovakia, by hockey stadiums, in his memory. The German Ice Hockey Federation announced that it would retire the No. 20 jersey of Robert Dietrich in Team Germany. 13 October 2011 game between the Pittsburgh Penguins and Washington Capitals, which featured Russian ice hockey players Alexander Ovechkin and Evgeni Malkin, was dedicated to Lokomotiv Yaroslavl. The teams wore commemorative Lokomotiv patches. All jerseys were autographed by the players and auctioned to raise funds for the families of those who died in the crash. On 12 March 2012, the Latvian Ice Hockey Federation announced that it would retire the No. 7 jersey of Kārlis Skrastiņš from Team Latvia. On 24 March 2012, the Dallas Stars (for whom Skrastiņš had played prior to signing with Lokomotiv) held a pre-game ceremony with Skrastiņš' family and announced a trust fund for Skrastiņš' children. Similarly, the Czech Ice Hockey Association decided to retire Czech Republic men's national ice hockey team jersey numbers in honor of its three late players. The numbers 4 of Karel Rachunek, 15 of Jan Marek, and 63 of Josef Vasicek have since been taken out of circulation. Following the tragedy, Lokomotiv Yaroslavl chose to cancel its participation in the 2011–12 KHL season. The club instead participated in the 2011–12 season of the Russian Major League (VHL), the second-highest ice hockey league in Russia after the KHL, starting in December 2011, and were eligible for the VHL playoffs. The KHL temporarily suspended its season-opening game already in progress and postponed the start of the season by five days. On 11 September 2011, President Medvedev ordered the grounding of all airlines "which are not adequately able to ensure passengers' safety". A deadline of 15 November 2011 was set to put into place "measures be developed to stop Russian air carriers' activities if they are not able to provide safe flights". Measures to bring aircraft up to international standards were to be sped up and the installation of new radio beacons to the latest COSPAS-SARSAT standard. Russian aviation authorities suspended all flights with the Yak-42 pending checks of other existing aircraft of the same type. On 21 September 2011, Yak-Service had its operating licence revoked by Rosaviatsiya after an audit of flight operations of the airline and as a result of the crash. The Interstate Aviation Committee (MAK) opened an investigation into the circumstances of the accident. The aircraft's flight data recorders were recovered the day after the accident. The fuel supply used to refuel the aircraft was quarantined, and samples were taken for analysis. The results were that the fuel in the storage tanks at Tunoshna Airport met the specified requirements for aviation fuel. Preliminary analysis of the flight recorders indicated that the aircraft's trimmable horizontal stabilizer was set to 8.7 degrees "nose up" and its wing flaps were in the take-off position of 20 degrees. The engines were functioning until the impact with the beacon mast. the engines continued working until the crash. the weather was ruled out as a factor. the crew carried out a check of all flight controls of the aircraft, including the elevator. The flight control surfaces responded as intended. the aircraft had 14 tons of fuel on board, of which eight tons was from the airport in Yaroslavl. prior to the takeoff, the stabilizer and flaps were set to takeoff position. The committee referred the study of the flight recorders and operational data to other research centers. The Technical Commission established contacts with the investigation authorities of the countries whose citizen were on board: Czech Republic, Germany, Slovakia, Sweden, Latvia and Canada. On 14 September 2011, a report in the newspaper Moskovsky Komsomolets, quoting a source in the aviation industry, claimed that the parking brake of the aircraft was on during the take-off, which significantly slowed it down and prevented it from accelerating properly. According to this theory, the captain had turned over control to the co-pilot before take-off, as he was not feeling well. As it is the captain's duty to release the brake, the co-pilot may not have been aware that it had not been done, or had forgotten to do so. LifeNews reported that investigators were investigating the pilots' professional history and that the pilots did not have sufficient experience on the Yak-42. On 15 September 2011, a report by RT stated that it was now believed that there was no evidence to show that the parking brake was engaged during the take off roll. RIA Novosti reported that Deputy Minister Okulov and Federal Air Transport Agency head Alexander Neradko both dismissed the theory in discussions with reporters at a press conference on 14 September 2011. The theory was also discounted by Konstantin Malinin, a former test pilot of the Yak-42, who noted that an engaged parking brake would have left skid marks and pieces of rubber on the runway, and there were none found. Two simulations of the crash were planned to help determine the cause. A "virtual" simulation used flight simulators. The data from the crashed Yak-42's flight recorders was loaded into a simulator, which then reconstructed the crash. A "live" simulation attempted to duplicate conditions of the crash, using a similar Yak-42, which launched from Zhukovsky Airfield. The Gromov Flight Research Institute conducted the tests. The Institute previously assisted the IAC in the investigation of the crash in 2010 that killed the president of Poland, Lech Kaczyński. On 17 September 2011, the MAK released further information about its investigation. It found the aircraft had started its takeoff with approximately 2,700 metres (8,900 ft) of usable runway length from its starting position. The aircraft started rolling down the runway with engines at nominal thrust, with takeoff thrust not being applied until six seconds later. Despite the increase of thrust the aircraft did not accelerate as expected. The committee report speculated that this could have been due to some braking force, and the committee stated it would send the braking system components to a "specialized institution" for a special examination. The aircraft reached a maximum speed of 230 km/h (140 mph). It did not lift off the ground until some 400 metres (1,300 ft) after the end of the runway, but at no point did it rise more than 5–6 metres (16–20 ft) off the ground. It then hit the airport beacon, deflected to the left and impacted the ground. The flaps and slats were in takeoff position, spoilers retracted, and the stabilizer set in a ten-degree position. The elevator controls were still connected. Captain: Time, headlights. We are taking off, top speed 190. Captain: Three, four, five, nominal [engine thrust]. Flight engineer: Nominal [thrust] on. Flight engineer: Speed is increasing. [Flight] parameters [are] normal. 130, 150, 170, 190, 210. Captain: [Switch to] takeoff [thrust]. Co-pilot: Maybe [it's] the stabilizer. Captain: Takeoff, takeoff [thrust]! Stabilizer! Co-pilot: What are you doing? Flight engineer: Takeoff [thrust] on. According to test pilot Anatoly Knishov, in an interview with Komsomolskaya Pravda, top speed 190 represents a decision point where, if failures occur before that speed, the aircraft is able to stop on the runway. At 210, the captain switched the engines to "takeoff mode" from "regular flight mode" or "nominal mode". According to Knishov, a nominal thrust/power mode is used for an empty aircraft, while all loaded aircraft use a takeoff mode. In his opinion, the switch-over from a nominal- to takeoff mode was late and unusual, as engine mode for taking off is normally agreed upon before starting a take-off run. Life News reported on 20 September 2011 the opinion of test pilot Magomed Tolboev. According to Tolboev, the cause of the disaster might have been a disagreement between the aircraft commander and the copilot. From examining a 100-metre (330 ft)-long skid mark on the runway, Tolboev suggested that one of them tried to brake, while the other was trying to take off. Tolboev also considered the Yak-42 not as advanced in its build and materials as contemporary Western models, heavier and less fuel-efficient, but still a "reliable vehicle" with "best rigidity". On 23 September 2011, Kyiv Post reported that the only survivor of the crash, flight engineer Sizov, was questioned by the investigative committee on 22 September 2011. According to Sizov, no problems were noted in the preparation for the flight, and the aircraft had no problems during its previous flight. Sizov also described the distribution of the passengers and luggage on the aircraft: Lokomotiv's coaches were in the front cabin; the players were in the rear cabin; and the luggage was carried in the rear luggage compartment. Kyiv Post also reported that a criminal investigation under Article 263 of the Criminal Code (flight safety violations causing two or more deaths) had commenced. On 10 October 2011, the Gromov Institute began its series of test flights. The simulations applied braking forces at different stages of the takeoff to determine what effects if any, the forces affected the ability of the aircraft to reach a take-off angle and speed. The first flight created a baseline takeoff, without any braking force applied. Simulation testing determined that pilot error was the cause as a braking force was found to have been applied by the chief pilot during takeoff. Using data from the flight recorder, it was determined the movement was only possible by pushing down on the brake pedals from the chief pilot's seat to push upwards on the control column. The investigating committee found evidence of the braking failure in the braking system. The committee released its final report on 2 November 2011. The committee found several problems that led to the crash. The first was that Yak-Service "did not properly control the quality of mastering the aircraft", finding that the crew did not train long enough on the Yak-42. The second was that the crew "did not calculate the takeoff parameters", changing the takeoff thrust during takeoff. While it was not determined which pilot applied the brakes, it was determined that one applied acceleration at the same time as the other applied braking. The co-pilot Zhuravlyov was found to have a banned drug phenobarbital in his system. According to Alexei Morozov, chief of the investigative commission, "the immediate cause of the [...] crash was the [...] crew's erroneous actions, namely the pilot stepping on the brake pedals before raising the nose wheel because of the wrong position of [his] feet on the [pedals] during takeoff." Federal investigators revealed in September 2012, that the pilot and co-pilot had falsified documents stating that they had undergone the necessary training for the Yak-42. Vadim Timofeyev, deputy head of airline Yak-Service, was charged with breaching air safety rules. His trial lasted from December 2014 until September 2015. He pled not guilty, blaming the crash on poorly placed cargo, but was found guilty on 23 September 2015 of violating Part 3 of Article 263 of the Russian Criminal Code, governing the safe operation of aircraft resulting in the manslaughter of more than two people. He was sentenced to five years in prison, but was amnestied under the 2015 Russian amnesty on the 70th anniversary of the end of World War II. ^ Urychev was injured and suspended at the time and was not originally scheduled to fly to the game, but he volunteered to go to support the team even though he was not able to play. Forward Maxim Zyuzyakin, 20, was left behind in Yaroslavl. ^ Korolev became a naturalized Canadian citizen in 2000 but had dual Russian and Canadian citizenship. ^ No weight scales were available at the airport to assess the actual baggage weight. Therefore, the Charter Airline estimated the total gross weight of the aircraft, which they determined was well under the limit. However, following the complete investigation, it was determined that the aircraft was actually overweight. This was a key factor for the excessive takeoff roll. ^ "Top KHL squad killed in passenger plane crash in Russia – RT". Rt.com. 7 September 2011. Retrieved 7 September 2011. ^ Крушение самолета Як-42 в Ярославской области (in Russian). Ministry of Emergency Situations. 7 September 2011. Archived from the original on 17 January 2012. Retrieved 7 September 2011. ^ a b "Russian ice hockey team wiped out in plane crash". Yaroslavl: RIA Novosti. 7 September 2011. Retrieved 7 September 2011. ^ a b "Experts find human factor behind Lokomotiv tragedy". RT. 19 October 2011. Archived from the original on 26 October 2011. Retrieved 26 October 2011. ^ a b Reuters (6 September 2012). 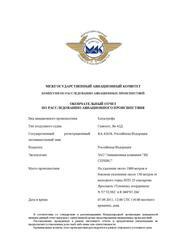 "Lokomotiv crash pilots flew illegally". Belleville Intelligencer. ^ "KHL President Alexander Medvedev says Lokomotiv Yaroslavl tragedy will bolster ties with NHL". Washington Post. Associated Press. 13 September 2011. Retrieved 13 September 2011. ^ "Tragic KHL plane crash impacts Detroit's Babcock". NHL. 7 September 2011. Retrieved 13 September 2011. ^ Morreale, Mark (7 September 2011). "Skrastins set then-ironman mark for NHL defensemen". NHL. Retrieved 13 September 2011. ^ Dupont, Kevin Paul (8 September 2011). "McCrimmon among plane crash fatalities". Boston Globe. Archived from the original on 16 May 2012. Retrieved 13 September 2011. ^ "Plane Crash Wipes Out Elite Russian Hockey Team". TotalNews. 7 September 2011. Archived from the original on 16 November 2011. Retrieved 8 September 2011. ^ "Commission Regulation (EC) No 1144/2009 of November 26, 2009 amending Regulation (EC) No 474/2006 establishing the Community list of air carriers which are subject to an operating ban within the Community". Eur-lex.europa.eu. Retrieved 8 September 2011. ^ Kaminiski, David (9 September 2011). "Yak Service had come under EU safety scrutiny". FlightGlobal. Retrieved 9 September 2011. ^ a b c d e "Як-42 RA-42433 07.09.2011" (in Russian). Interstate Aviation Committee. 7 September 2011. Archived from the original on 23 September 2011. Retrieved 9 September 2011. ^ "List of Russian plane crash victims". San Diego Union-Tribune. The Associated Press. 8 September 2011. Retrieved 8 April 2018. ^ a b Kaminiski, David (8 September 2011). "Yak-42 failed to gain height and hit the beacon: ministry". FlightGlobal. Retrieved 8 September 2011. ^ Нелетная страна. Rosbalt (in Russian). 8 September 2011. Retrieved 8 September 2011. ^ "Accident description". Aviation Safety Network. Retrieved 8 September 2011. ^ Maloveryan, Yuri (7 September 2011). "Russia's Lokomotiv ice hockey team in air disaster". BBC News. Retrieved 9 September 2011. ^ a b Hradecky, Simon (12 September 2011). "Crash: Yak Service YK42 at Yaroslavl on Sep 7th 2011, failed to climb on takeoff". The Aviation Herald. Retrieved 14 September 2011. ^ "Poor-quality fuel emerges as possible cause in fatal Russian jet crash". The Globe and Mail. 8 September 2011. Retrieved 8 September 2011. ^ Выживший бортинженер пытался спасти пилота. NTV (in Russian). 8 September 2011. Retrieved 8 September 2011. ^ "Last second Yak-42 were recorded on video". NTV (in Russian). 8 September 2011. Retrieved 8 September 2011. ^ a b Earle, Jonathan (9 September 2011). "News Feed: Lokomotiv Yaroslavl Plane Crash". Moscow Times. Retrieved 15 September 2011. ^ "Яковлев Як-42Д Бортовой №: RA-42434" (in Russian). russianplanes.net. Retrieved 8 September 2011. ^ Разбившийся Як-42 израсходовал 40% летного ресурса, сообщили эксперты (in Russian). Moscow: RIA Novosti. 7 September 2011. Retrieved 7 September 2011. ^ "Russian investigators probe KHL jet crash". CBC News. 8 September 2011. Retrieved 8 September 2011. ^ Дмитрий Медведев почтил память погибших в авиакатастрофе под Ярославлем (in Russian). Presidential Administration of Russia. 8 September 2011. Retrieved 9 September 2011. ^ a b c d "Medvedev Orders Airline Overhaul After Lokomotiv Yaroslavl Tragedy". Moscow Times. 9 September 2011. Retrieved 9 September 2011. ^ СПИСОК экипажа и пассажиров, находившихся на борту воздушного судна Як-42 (Press release) (in Russian). Ministry of Emergency Situations. 7 September 2011. Archived from the original on 26 July 2012. Retrieved 7 September 2011. ^ "Full list of people on board of crashed Yak-42". Russia Today. 7 September 2011. Retrieved 7 September 2011. ^ "Yaroslavl crash survivors to be flown to Moscow". Voice of Russia. 8 September 2011. Archived from the original on 23 September 2012. Retrieved 9 September 2011. ^ Хоккеист «Локомотива» Галимов скончался в больнице. Interfax (in Russian). 12 September 2011. Retrieved 5 August 2016. ^ "Russian ice-hockey plane crash survivor dies". RIA Novosti. 12 September 2011. Retrieved 12 September 2011. ^ "Only survivor of Russia ice hockey plane crash released from hospital | Russia | RIA Novosti". En.rian.ru. 28 October 2011. Retrieved 8 January 2012. ^ a b Pinchevsky, Tal (7 September 2011). "Victims of 2011 Lokomotiv plane crash". NHL.com. Retrieved 12 February 2018. ^ Посольство Украины подтвердило гибель трех украинцев в крушении Як-42 (in Russian). Moscow: RIA Novosti. 7 September 2011. Retrieved 7 September 2011. ^ Названа причина крушения Як-42 в Ярославле (in Russian). Rambler Media Group. 7 September 2011. Retrieved 7 September 2011. ^ Врачи опровергли сообщение о смерти хоккеиста Галимова. Gazeta.ru (in Russian). 7 September 2011. Retrieved 7 September 2011. ^ Lynn Berry (7 September 2011). "Russian jet crash kills 43, many top hockey stars". Forbes. Retrieved 7 September 2011. ^ a b Хоккеист Урычев не должен был лететь с "Локомотивом" в Минск (in Russian). RIA Novosti. 8 September 2011. ^ Gulitti, Tom (7 September 2011). "Devils' prospect among those killed in Russian hockey team plane crash". northjersey.com. Archived from the original on 17 November 2011. Retrieved 7 September 2011. ^ Feschuk, Dave (8 September 2011). "Ex-Leaf Korolev was devoted to family". Toronto Star. Retrieved 11 September 2011. ^ "Feschuk: Last-minute decision to stay spared coach's life". thestar.com. 8 September 2011. Retrieved 8 September 2011. ^ "Lokomotiv Yaroslavl ice hockey team killed in a plane crash". Presidential Administration of Russia. 7 September 2011. Retrieved 7 September 2011. ^ "Medvedev lays flowers at Yaroslavl crash site". Tunoshna: RIA Novosti. 8 September 2011. Retrieved 9 September 2011. ^ "Yaroslavl plane tragedy". Kontinental Hockey League. 7 September 2011. Retrieved 7 September 2011. ^ Ladyman, Ian (8 September 2011). "Manchester United reach out to Russia after plane crash kills 36 players of top ice hockey team". Mail Online. Retrieved 8 September 2011. ^ Wyshynski, Greg (8 September 2011). "Plane crash kills 'majority' of KHL team Lokomotiv – Puck Daddy – NHL Blog – Yahoo! Sports". Sports.yahoo.com. Retrieved 8 September 2011. ^ "KHL season opener stunned by Yaroslavl tragedy". RT. 7 September 2011. Archived from the original on 15 September 2011. Retrieved 15 September 2011. ^ "Minsk arena pays tribute to late Yaroslavl team". RT. 8 September 2011. Retrieved 15 September 2011. ^ "Silent start for postponed KHL season". RT. 13 September 2011. Archived from the original on 15 September 2011. Retrieved 15 September 2011. ^ Compton, Brian (7 September 2011). "Nabokov, Yashin stunned by tragedy in Russia". New York Islanders. Archived from the original on 12 November 2013. ^ Japradize, Misha (10 September 2011). "Heartbreak in Russia as thousands mourn victims". Associated Press. Retrieved 10 September 2011. ^ Associated Press (10 September 2011). "Russian plane crash memorial draws 100,000". CBC.ca. Retrieved 10 September 2011. ^ Sebastian Mattsson (12 September 2011). "Galimov död – avled efter skadorna" (in Swedish). Expressen. Archived from the original on 12 July 2012. Retrieved 12 September 2011. ^ Hunt, Steve (13 September 2011). "Stars to honor Skrastins with helmet decal". NHL. Retrieved 15 September 2011. ^ Williams, Terrell (15 September 2011). "Canes to Honor Vasicek with Patch on Sweaters" (Press release). Carolina Hurricanes. Retrieved 15 September 2011. ^ "Fin minnesstund för Liv" (in Swedish). Hockeykanalen. 10 September 2011. Retrieved 10 September 2011. ^ a.s., Petit Press. "Dres s číslom 38 už neoblečie žiadny slovenský hokejista". ^ "Team Germany honors Yaroslavl victim Dietrich". Taiwan News. Associated Press. 28 September 2011. Retrieved 29 September 2011. ^ "Caps & Pens dedicate clash to Lokomotiv Yaroslavl". RT. 4 October 2011. Archived from the original on 14 October 2011. Retrieved 11 October 2011. ^ "LHF iemūžinās Skrastiņa 7.numuru izlasē". Diena.lv. 12 March 2012. Retrieved 12 March 2012. ^ Hunt, Steve (24 March 2012). "Stars honor Skrastins in pre-game ceremony". NHL. Retrieved 25 March 2012. ^ Grigory Sysoey (10 September 2011). "Russia's Lokomotiv ice hockey team to miss season after air disaster". RIA Novosti. Retrieved 10 September 2011. ^ "KHL's new Lokomotiv won't play this season". Red Light. 12 September 2011. Archived from the original on 18 October 2011. Retrieved 12 September 2011. ^ "Plane crash tragedy to change Russian skies". RT. 11 September 2011. Retrieved 15 September 2011. ^ "Yak-42 flights suspended after fatal Yaroslavl crash. 07/09/11". Flight Global. 8 September 2011. Retrieved 8 September 2011. ^ Sobol, Ekaterina; Pirigov, Ivan (21 September 2011). Авиакомпания "Як-Сервис" лишилась лицензии (in Russian). Kommersant. Archived from the original on 23 September 2011. Retrieved 23 September 2011. ^ "The wreckage of Yak-42 pick up from the bottom of the Volga". Rosbalt (in Russian). 8 September 2011. Retrieved 8 September 2011. ^ Разбившийся Як-42 был заправлен качественным топливом. Новые Известия (New News) (in Russian). 10 September 2011. Retrieved 12 September 2011. ^ a b "Yak-42" (in Russian). Interstate Aviation Committee. Archived from the original on 23 September 2011. Retrieved 9 September 2011. ^ Следствие установило, что Як-42 под Ярославлем рухнул из-за "ошибки блондинки", утверждает "МК" (in Russian). 14 September 2011. Retrieved 14 September 2011. ^ a b "Doomed pilots may have had brake on at takeoff". RT. 14 September 2011. Retrieved 14 September 2011. ^ "Officials rule out 'emergency brake' theory of Yak-42 crash". Russia Today. 15 September 2011. Retrieved 15 September 2011. ^ Крушение Як-42 произошло не из-за стояночного тормоза, заявил Минтранс. RIA Novosti (in Russian). 14 September 2011. Retrieved 15 September 2011. ^ Причиной крушения Як-42 не мог стать стояночный тормоз, считает летчик. RIA Novosti (in Russian). 15 September 2011. Retrieved 15 September 2011. ^ "Yak-42 crash to be simulated, live and virtually". RT. 16 September 2011. Retrieved 16 September 2011. ^ "Як-42 RA-42433 07.09.2011" (in Russian). Interstate Aviation Committee. 17 September 2011. Archived from the original on 23 September 2011. Retrieved 17 September 2011. ^ a b "Did pilots' misunderstanding turn fatal for Yak-42?". RT. 19 September 2011. Retrieved 21 September 2011. ^ Jones, Tom (20 September 2011). "Transcript reveals new details of Lokomotiv Yaroslavl crash". Czech Position. Archived from the original on 28 September 2011. Retrieved 23 September 2011. ^ Mogutin, Nikita (20 September 2011). Эксперт: Як-42 рухнул из-за конфликта пилотов. Life News (in Russian). LifeNews.ru. Retrieved 23 September 2011. ^ Jones, Tom (20 September 2011). "Sole survivor of plane crash details". Planecrashes.org. Retrieved 11 June 2013. ^ Interfax Ukraine (23 September 2011). "Flight engineer from plane that crashed near Yaroslavl questioned". Kyiv Post. Retrieved 23 September 2011. ^ "Yak42D Investigation (section 10/10/11)" (in Russian). MAK. 11 October 2011. Archived from the original on 23 September 2011. Retrieved 11 October 2011. ^ "Yak-42" (in Russian). MAK. Archived from the original on 23 September 2011. Retrieved 26 October 2011. ^ "Pilot error blamed for plane crash". ESPN. 2 November 2011. Retrieved 19 November 2013. ^ "Probe Finds Pilot Error in Russian Hockey Team Plane Crash". Radio Free Europe. 2 November 2011. Retrieved 2 November 2011. ^ Wyshynski, Greg (23 September 2015). "Russian airline CEO guilty in Lokomotiv plane crash case". Retrieved 12 April 2018. ^ "Sole person blamed for death of ice hockey team in 2011 plane crash amnestied". TASS. 23 September 2015. Retrieved 12 April 2018. Wikimedia Commons has media related to 2011 Yaroslavl plane crash.